A stubborn fire sparked by a gas leak inside a vacant Laundromat heavily damaging a strip mall in Boyle Heights Friday morning. The blaze at the one-story commercial mall – located at 2191 E. Whittier Blvd. near Boyle Avenue – was reported at 1:47am, said department spokeswoman Margaret Stewart. It took nearly an hour and 75 firefighters to knock down the flames, she added. No injuries were reported, according to the Los Angeles Fire Department. The fire originated in the building housing Lianas Laundry, a coin-operated Laundromat, according to Steward. The heavy fire caused the front fascia of the structure to collapse, making it unsafe to enter. 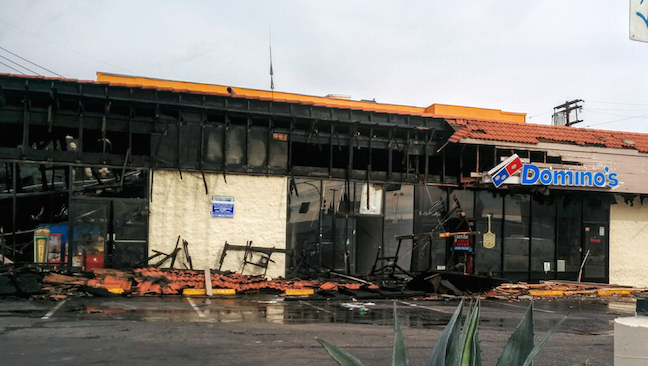 A Domino’s Pizza adjacent to the Laundromat was also damaged. Chris Chizmedhyan owner of the Laundromat told EGP the business was destroyed by the time he arrived in the early morning. “I live in Hollywood and a friend called me asking what happened,” said the owner who was unaware of the incident until he received the phone call. Jose Viramontes, manager of the adjacent Domino’s Pizza, was standing outside on the sidewalk with a few employees staring at the burned out facades of the businesses. He told EGP four employees were about to close the pizza-selling business when they heard a loud noise, “like an explosion,” They rushed outside and discovered the Laundromat roof on fire. “They got out and called 911,” said Viramontes. “The fire on the roof continued into our location,” he added. Viramontes said about 32 Domino’s Pizza employees—including 18 pizza deliver drivers — and up to three employees of the Laundromat will likely be out of a job. “Authorities told us it may take months to build everything again,” he explained. Scenes from the film “Under the Same Moon” with Mexican Actress Kate del Castillo were filmed at Lianas Laundry, according to Chizmedhyan. An “iconic” place for the movie fans, he said. “Luckily no one was inside of the laundry at that moment,” he said. An arson investigation is being conducted. Updated: 1-23-16 to correct spelling. January 22, 2016 Copyright © 2012 Eastern Group Publications, Inc.